March is here, and in my hometown it's coming in like a lamb. I suppose that means it'll go out like a lion, right? Then I saw in the right hand of him who was seated on the throne a scroll written within and on the back, sealed with seven seals. And I saw a mighty angel proclaiming with a loud voice: "Who is worthy to open the scroll and break its seals?" And no one in heaven or on earth or under the earth was able to open the scroll or to look into it, and I began to weep loudly because no one was found worthy to open the scroll or to look into it. And one of the elders said to me, "Weep no more; behold, the Lion of the tribe of Judah, the Root of David, has conquered, so that he can open the scroll and its seven seals." SPECIAL NOTE: I've created a version of the artwork above that can be printed and framed. Click here to access a 4"x6" version. Click here to access a 5"x7" version. A most beautiful post, Richella. Have a blessed weekend! I could just be raptured on those words! 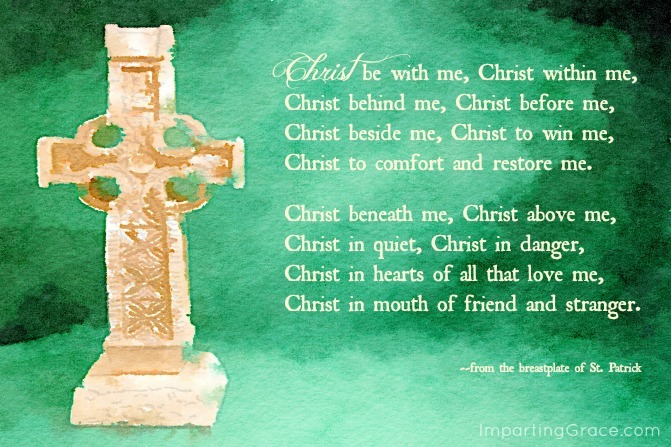 What beautiful and true thought about the Lion and the Lamb! To Him who sits on the throne - the song of Heaven. Beautiful post Richella. This gave me goose bumps. When I hear the truth proclaimed on a public forum I am always taken aback. Thank you for your boldness in proclaiming God's word so beautifully. Your blog touches my heart. My heart just soars with these words from Revelation...knowing how strong and mighty, yet peaceful and gentle He is, too. 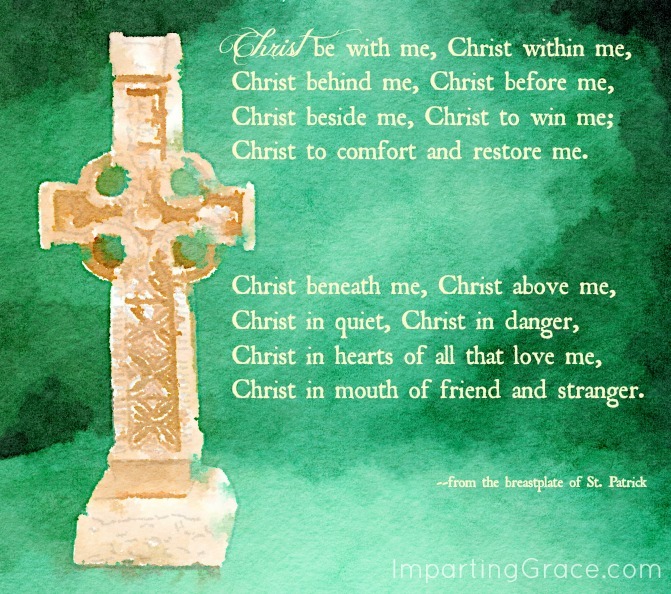 May March and all our days be lived out by the words on St. Patrick's breastplate. And by the way, is this your art? It's lovely. Jen, this is my art, created with the help of Waterlogue and PicMonkey. The cross belongs to me--it's from the gift shop at the Metropolitan Museum of Art. I placed it on a green cloth and photographed it, then ran that photograph through the Waterlogue app. I then took the Waterlogue print and edited it with PicMonkey to produce the graphic here. I'm so glad you like it! Hello, I appreciate your writing. Meditation is really healthy. Before I first started meditating I suffered from bad headaches daily, but when i started meditating the headaches were gone. I suffered from bad acid reflux and digestion problems for awhile recently but I've started meditating again and I don't have those problems anymore. I was always really tired but then I started meditating and I'm not tired anymore. It's great. I'll never stop meditating again. I will do it everyday. thanks a lot!